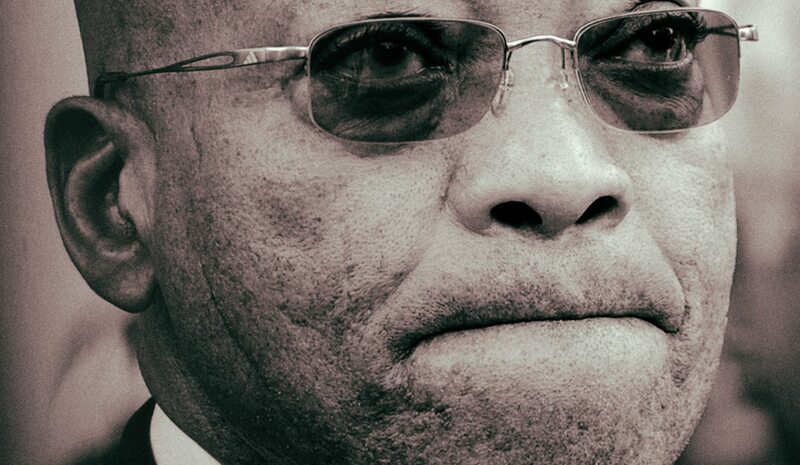 President Jacob Zuma and the law have what you could call an interesting relationship. He is often accused of believing that he is above the law – he has joked that he would like to be a dictator, even for 'only' six months. And time and time again, he has challenged the interpretation of our laws, only to find himself on the losing side. On Monday came news that the Chief Operating Officer of the SABC, Hlaudi Motsoeneng, had his appeal to the Supreme Court of Appeal turned down. Last week, (advocates for now, until their next appeal is turned down) Nomgcobo Jiba and Lawrence Mrwebi took special leave from the National Prosecuting Authority after being found by a judge to be not fit and proper for their posts. When Zuma goes, he is going to leave a body of law that will make it much harder for anyone to ever try to take power in this way again. The law of unintended consequences strikes again. By STEPHEN GROOTES. On Saturday night the former Constitutional Court Judge, Zak Yacoob, spoke at a dinner in aid of Finance Minister Pravin Gordhan and former SARS executives Ivan Pillay and Johan van Loggerenberg. During his remarks, he said that Zuma was “dishonest” and “disrespectful” of other people. On Monday, speaking on the Midday Report, Yacoob said that while maybe he should have been more courteous in his comments, he still believed that Zuma did not tell the truth. He even went as far as saying he believed Zuma himself would not say that he told the truth. He also put into words what many of Zuma’s critics feel, that Zuma is “manipulating the country for his own ends, and to protect himself”. That’s strong criticism from anybody, never mind a former judge of the Constitutional Court. Never mind someone who first joined the ANC in 1967. In a way, Yacoob could almost be speaking for all of the judges who’ve heard cases relating to Zuma. Anyone who knows anything about our court system will know the value of precedent. Like most court systems in democracies, our courts rule using this system. If the highest court in the land makes a ruling, should a case come along that presents similar questions, that higher court ruling must be used as a guide to settling the new dispute. If a lower court makes a finding and that finding is not challenged through an appeal, then that finding also stands as a precedent (although there can be certain caveats around this). Along the way, the law is developed. So, if the Constitution talks about “meaningful consultation”, eventually a case will come along that demands a proper interpretation of that phrase. In this case, the community of Matatiele on the border between the Eastern Cape and KwaZulu-Natal challenged the decision, and that led to the bench handing down a definition of “meaningful consultation”. Thus, communities cannot be ignored again in the future. One of the hallmarks of Zuma’s administration has been a certain stubbornness with regard to the law. Time and time again a high court judge has ruled against a decision of his government. Many times the decision has been around the appointment of a certain individual, or about an individual, or related to the politics of the nation. When Zuma appointed Advocate Menzi Simelane as his first National Director of Public Prosecutions, it was pretty obvious that Simelane would not be found to be “fit and proper” under the law. There was prima facie evidence that he had lied under oath. But Zuma persisted. And appealed. The reason for these appeals was the short-term goal of ensuring that he himself would not face corruption charges. But in the end, the Constitutional Court ruled against the appointment. This meant that in the longer term life got more complicated for Zuma. He had to find someone who he believed would not charge him with corruption, but who would also fit the definition of “fit and proper”. First, he tried not to appoint anyone at all. Then, when his hand was forced by the filing of yet another court application to compel him to make an appointment, he looked for someone he could keep weak. Hence the appointment of Mxolisi Nxasana. A person who had some baggage, in the form of having once been accused of murder (he was acquitted on the grounds of self-defence). But this didn’t actually work out for Zuma: Nxasana started fighting with Advocates Jiba and Mrwebi, who where Zuma’s point people at the NPA. Nxasana also refused to toe the Zuma line, and under the terms of the NPA Act, he had very little to lose by doing the right thing. Of course, things could have turned out very differently. If Zuma had decided not to appeal the first rulings against Simelane, there would not have been that final finding around “fit and proper” and how it relates to the National Director of Public Prosecutions. And if that definition had not existed, then Zuma may have been able to appoint the person who would have been his first choice, who was surely Jiba herself (whose husband had had his criminal record expunged by Zuma). Last week’s ruling relating to Jiba and Mrwebi has further developed the definition of “fit and proper”. Significantly, they have also made it that much harder for anyone ever again to try to use the NPA to protect a political ally, such as Richard Mdluli. It thus looks as if Zuma’s pursuit of a short-term aim made his life much more complicated in the longer term. The powers of the president over the NPA have become one of the most important areas of contestation of Zuma’s time in power. Now, as a result of his missteps, it is going to be very difficult for any future president to try to impose someone who is not fit and proper again in the future. The same applies of course in a case that might turn out to be even more important over the longer run. Since the establishment of the office of the Public Protector, there has been a little bit of doubt over the powers of the office. The Public Protector would make “findings” and then issue “remedial action”. But the power to enforce that remedial action became intensely contested terrain. It is not any more. Again, thanks to Zuma’s catastrophic missteps, where he even managed to drag the entire of Parliament to the wrong side of Constitution. No one needs reminding about who it was that benefited from the spending by government on a certain home in Nkandla. And of how that person insisted on his political party defending him to the hilt. Which forced the Public Protector to make a finding. And then, in what surely must have been a red warning sign to Zuma himself, that finding was that he should “pay back the money”. It is difficult to know what happened behind the scenes. And who it was that decided Advocate Jeremy Gauntlett, a person passed over for a judge-ship several times, should now represent Zuma. Or how on earth he was able to persuade Zuma that he had to make some concessions. But the damage was done. The point was made. In law. The findings of the Public Protector must either be complied with, or challenged in a court. This has huge implications. The Public Protector can investigate all manner of complaints across much of society. It is now not just presidents who have to comply or legally challenge her rulings, it is everybody in authority, period. All because of the Zuma’s stubbornness and epically bad legal advice he was acting upon. South Africa is one of those countries where some people claim it is easy for a leader to come along and behave less than democratically. But what has happened, partly because of the courts, partly because we are a somewhat sophisticated country, and partly because of the eternal vigilance our people show in defense of their freedom, is that the system has pushed back against a person who has tried to usurp it. Zuma may not be a “classic dictator”, but he has shown less than total respect for the rule of law from time to time. He fought the law, and the law won.